VANCOUVER, BC--(Marketwired - December 06, 2016) - Genesis Metals Corp (TSX VENTURE: GIS) ("Genesis" or the "Company") is pleased to announce results from resampling of drill core from programs previously conducted by other companies between 1989 to 2008 and new trench sampling results at its the 100% owned Chevrier gold project (the "Project") near Chibougamau, Quebec. These new results complement news issued by the Company on November 17, 2016. The table and X-Y chart below provide further comparison of the results of the re-assay program. The resampled drill holes represent some 12% of a total of 123 holes that have been previously drilled in the Chevrier main zone by other companies. 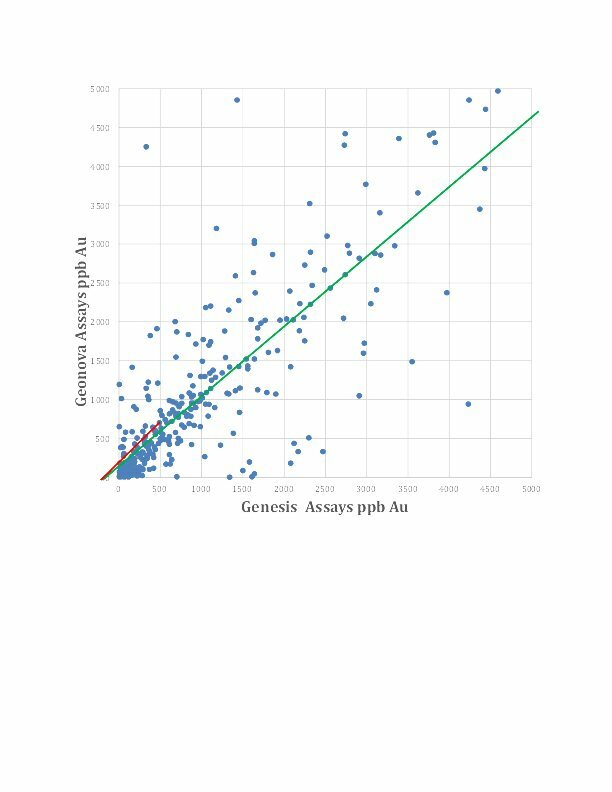 The X-Y chart shows very close agreement between original core assays and the Company's resampling and assaying. The new assay data support the results from this earlier drilling and aid the Company's objective of establishing the veracity of assay results that were reported prior to the implementation of National Instrument 43-101. Genesis' CEO Brian Groves commented, "The results from our resampling and analysis of existing drill core from work by other companies carried out prior to National Instrument 43-101 provides a high level of confidence in the results of previous work. These results and those still awaited are building a foundation for the Company's further assessment of the known gold mineralization at Chevrier and the entire prospective greenstone belt. We believe this systematic, patient, low budget activity continues to confirm our confidence in the potential of the Chevrier Project." All drill core examined and resampled was stored at the former Copper Rand mine site in Chibougamau. Due diligence undertaken by the Company to ascertain and confirm the provenance of the core included: 1) confirmation of drill hole numbers on core boxes with those numbers cited within assessment reports filed by each of Minnova and Geonova with the Quebec government (MERN - Ministère de l'Energie et des Ressources naturelles), 2) comparison of drill logs within said assessment reports to visual inspection of the core by representatives of the Company and 3) confirmation of assay sample intervals, assay tags and assay certificates with those cited within assessment reports. All samples collected from the existing core and new trench were sent to SGS laboratories in Quebec City for sample preparation and then to Lakefield, Ontario for analysis. Upon arrival, all samples were sorted and checked against the sample submission form before entering the preparation laboratory. All samples received by SGS were logged in and sorted with their LIMS system. The samples were verified against the Company's submission list. If needed the samples were then dried at 60 degrees C. All samples were then crushed to better than 90% passing -10 mesh. 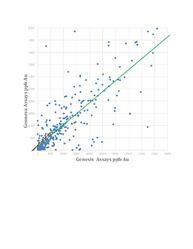 The samples were then riffle split and an approximately 1000-1500 grams aliquot were pulverized to 85% passing -150 mesh and analyzed for gold by fire assay on a fraction of 50 grams with an AES finish and a gravimetric finish for values greater than 10 g / t Au. For quality control, in each submission, certified standards and blanks were inserted at regular intervals throughout the sequence of samples. The data were reviewed by Robert Banville, eng., Qualified Person as defined by National Instrument 43-101.